While such awesome cars as the McLaren MP4-12C, Audi R8, Mercedes SLS AMG, Ferrari 458 Italia, BMW Z4 and Porsche 997 are the types of cool cars that can be seen pounding around selected European venues; with the season’s six races having begun at Monza, followed by Silverstone, Paul Ricard, Spa-Francorchamps, (24-hours) the Murburgring and finishing at Spain’s Circuito de Navarra. Yet thanxs to Tricia, I was informed Robert would once again be competing at the Silverstone round of the Blancpain series with the same team and thus inquiring with said competitor I discovered that he was co-driving the No. 70 Race Art BMW Z4 which ran as high as tenth before sliding backwards to finish 18th in class. As Robert next plans to contest the Spa 24hrs round with the same team, as this is the only 24-hour event in the series with the rest all being three hours in duration. 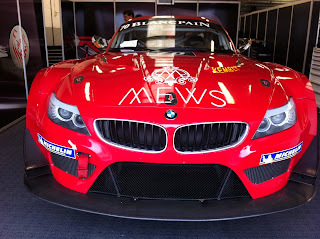 For some more pictures of the fabulous looking BMW Z4 “Art Car” you may wish to check out; click here.